Springs Coming! I made these for the people that can't get outside to fly a kite. Now you can fly one on you desktop! this is great!! The animations are really fun. I'm a kite flyer from way back, I love this set. Who told you I didn't go outside ????? Love the cursor, it's tail is amusing. This is TOO much fun! Great work, R_FX! Creative set!!! I like it, though it is quite an active cursor, I don't know how long I'll be able to handle it. Lot's of dizzying motion there... He he... Otherwise simply cool. How come I couldn't think of this? Thanks everyone! Everyone here makes the "Learning" process so much easier. Really, thanks to everyone. As for you, Ingui, Tombala and werewolf, you guys are like a family of encouragement. Thank you. I've been behind...am catching up on cursors! Radial...this is SO much fun! You did an AMAZING job with the animations! These made me giggle with delight! 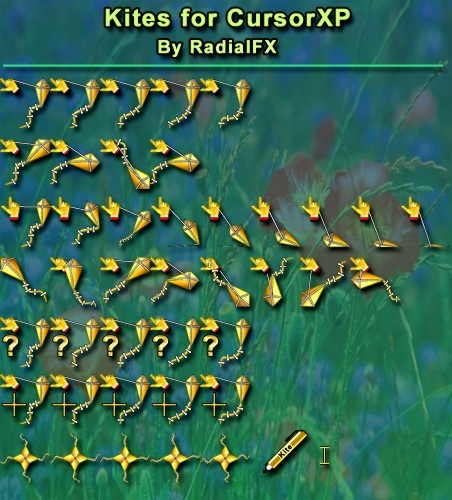 LOL This is a VERY creative and ORIGINAL set of cursors! Congrats, sweetie! Angel_Wings is an OFFICIAL Radial_FX fan!